Tattoo ink particles are extremely small so optimally a very short pulse is needed to break them up. PicoSure is a picosecond domain device, producing pulse durations in the trillionth of a second. PicoSure works first by appplying a mechanical or acoustic effect that simply breaks up the pigment; second is a thermal effect. 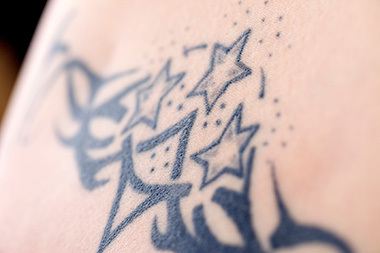 Unlike previous lasers used to remove tattoos, the PicoSure laser deposits an extreme amount of energy so fast that the tattoo ink, experiences significant photomechanical effects leading to a break-up of the ink or pigment particles. It can even remove difficult ink colors as well as previously treated tattoos faster and with fewer treatments. With data indicating that an estimated 20 percent of the 45 million Americans with at least one tattoo want to have it removed, the FDA clearance of PicoSure creates a first-mover advantage to treat a large and vastly underserved market. PicoSure delivers photothermal and significant photomechanical effects to the tattoo or pigmented lesion while leaving the surrounding tissue unheated. The speed of the picosecond laser makes this technology ideal for aesthetic applications in which large photomechanical stresses are applied to a particular target.